St. James Church (St. Jacobikirche). 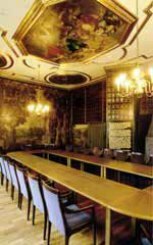 Not only church policy was formulated in the Ministers’ Hall, decorated with the coats of arms of former pastors and vicars of the parish. Church leaders intervened here actively in the administration of the city, but also conducted joyous celebrations. This is evident in the embellishment of the hall. The painter J. M. Riesenberger, active working for the Hamburg theatre, created a number of ceiling paintings and wall coverings. During restoration work in 1992, Renaissance frescoes were discovered underneath the wall coverings (including a fresco of David playing the harp), which likewise should be preserved. The frescoes were saved with the help of the Hamburg Monument Foundation. It was possible to create a movable frame for the wall covering guaranteeing constant access to the Renaissance paintings lying behind.